Pittsburgh's landscape is a rolling prairie filled with beautiful trees that change color with each season. Along with the majestic beauty Pittsburgh has fun festivals, arts and crafts, shopping, golf, spectator sports, fine dining, museums, great outdoor activities and so much more. Pittsburgh offers a range of culture and arts typically found in cities twice its size, while maintaining the safety and accessibility of a small town. A few of Pittsburgh's favorite family things include: The Carnagie Science Center, Pittsburgh Zoo, and Kennywood Park. There are many more attractions and activities sure to please any age group, whether it's a seven-year old visiting Mr. Roger's Neighborhood of Make Believe at Idlewild Park or a teenager bent on what's undeniably cool as she walks on the wild side through The Andy Warhol Museum. Visitors have the chance to discover the rich history and heritage of this charming city by visiting museums, landmarks, and craft artists as they show you century-old techniques. Marietta also has a huge shopping culture as you will find out when you stop in at the many unique boutiques, antique stores, galleries, and confectionery stores. If you are looking for a relaxing activity then taking a quiet river cruise is an excellent way to enjoy the scenery of this beautiful city. Maysville is a wonderful getaway destination that offers something for everyone. Maysville-Mason park is an excellent place to take in the beautiful kentucky scenery while enjoying the par-three gold course, 12-acre fishing lake, walking trail, and olympic size swimming pool. Maysville is also a popular location for ATV and dirt bike trail riding. Surrounded by beautiful green pasture, visitors are invited to visit a farm and learn about how people lived in during colonial times. Cincinnati has a variety of attractions, fine dining and shopping, and family activities that are sure to please everyone. The Cincinnati Museum Center at Union Terminal offers five great museum in one historic location, and has an amazing collection of dinosaurs. For nature lovers there is the Cincinnati Zoo, Botanical Gardens, and Loveland Bike Trail. Visitors can discover the hundreds of festivals and one-of-a-kind events in Cincinnati, from culinary treats to major music festivals, the region is abuzz with activity all year long. Louisville is the largest city in Kentucky and an industrial, financial, marketing, and shipping center of the South. The city has some of the nation's largest whiskey distilleries and cigarette factories. Louisville developed as a portage place around the falls and as a river port and major commercial center. 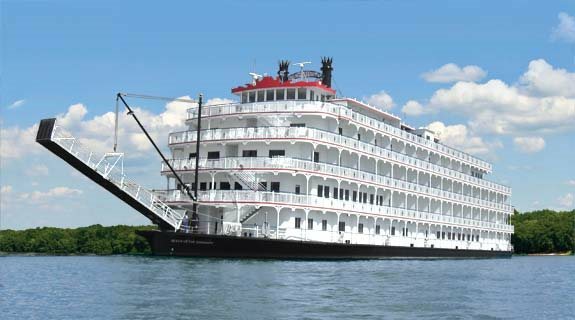 Many of the nation's most famous steamboats were constructed there. Churchill Downs, a noted racetrack, is scene of the annual Kentucky Derby. The city has noted parks and is site of the state fairgrounds. It has a symphony orchestra and an opera company and hosts an annual festival of new American plays. Among points of interest are American Printing House for the Blind; J.B. Speed Art Museum; Kentucky Center for the Arts; Actors Theater of Louisville; “Farmington”; Filson Club, with a historical library and museum; Jefferson County Courthouse; and Cave Hill Cemetery, where Clark is buried. Nearby is “Locust Grove,” the last home of Clark, as well as the burial place of Zachary Taylor. Fort Knox is in the area. 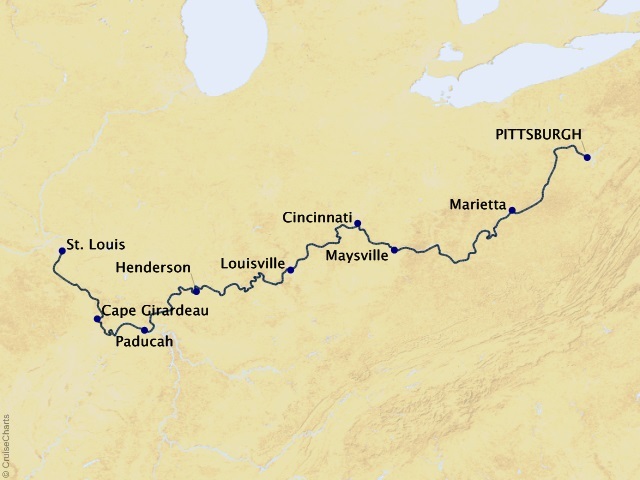 Henderson lies along the beautiful Ohio River, and offers a beautiful riverfront, great southern food, and friendly hospitality. Before prohibition, Kentucky had the largest number of vineyards in the U.S. and reviving this tradition Henderson invited visitors to enjoy wine tasting at a number of wineries, including Ruby Moon Winery. In June the W.C. andy Blues & Barbecue Festival offers excellent food and entertainment by some nationally know artists, as does the the Bluegrass in the Park & Folklife Festival. Paducah is a thriving, artistic city on the banks of the Ohio River. The city supports its artisans through incentive programs, offering the opportunity to create a truly unique community. Along the riverfront, the Market District hosts many opportunities for dining, shopping and museum going. You can also see giant murals along 2nd Street, painted by Robert Dafford. In the Lowertown Art District, visit a plethora of art galleries, independent coffee houses and unique "fusion" dining. For a look at the region's crafts, visit the William Clark Market House Mueum or the annual Quilt Show, which occurrs every April. Every May, Lowertown hosts a fine art and music festival, highlighting local artists and musicians in a lively, all day event. A friendly river town along the mississippi, Cape Girardeau is dotted with majestic white oaks, and natural beauty. At the Trail of Tears State Park there are numerous trails, and opportunity for hiking, backpacking, and horseback riding. Other attractions include historical heritage homes, museums, and Fort D a site from the Civil War. St. Louis's "gateway to the west", the Gateway Arch, is a nationally recognized site as it stands over 630 feet above the Mississippi River. Although the arch is a great site, visit some other St. Louis attractions including: historic landmarks, museums, sightseeing, shopping, and accommodations to fit every budget. St. Louis has attractions and activities for a family on vacation, someone visiting for business, or a couple searching for romance. Boating tours, museums, historic sites such as the village where Daniel Boon lived, shopping, fine dinging, and educational attractions are all within minutes from anywhere in the city. St. Louis offers culture, sophistication, old world charm, and fantastic architecture. Prices are per person based on double occupancy. Pricing on some sailings may reflect special limited time offers, not combinable with any other offers/discounts. Valid on new bookings only.